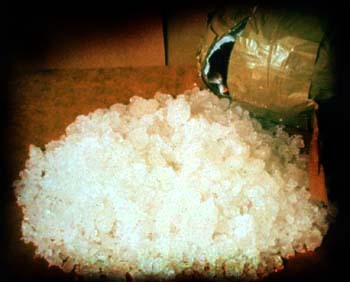 "Ice" is recrystalised methamphetamine hydrochloride. Methamphetamine is a potent stimulant first synthesized in Japan in 1919. Ice generally takes the form of clear crystallised chunks. It will dissolve in water and breaks down to smaller particles. Ice induces a profound sense of euphoria in the user by blocking the reuptake, and stimulating the release, of dopamine and noradrenaline in the central nervous system. It is a "power drug" whose use is typically followed by prolonged depression and fatigue. In contrast to base cocaine, smoking meth will extend its effects for up to 24 hrs per ingestion. Smoked in a base form, meth is unappetisingly known on the street as SNOT. It can only be smoked. SNOT gets its name on account of its resemblance to the natural product of the same name. It is very addictive. Smokable methamphetamine is similar to smokable cocaine, crack. They may both briefly be delightful. But they offer only a toxic and delusive short-cut to the biological nirvana awaiting our descendants.